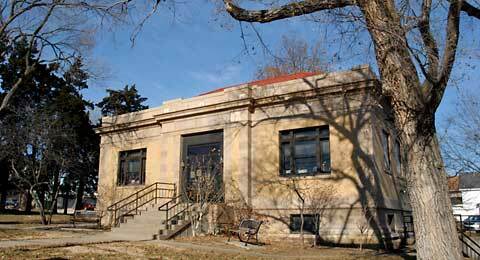 Celebrating its 100th anniversary in 2010, the Lyndon Carnegie Library is the only Carnegie library in Osage County. Located at 127 E. Sixth St., in Lyndon, the library is operated by the Valley Brook Township, and is believed to be the smallest Carnegie library built. Lewis Hussey, who served as Lyndon’s mayor 1909 to 1915, is credited with securing funds from Andrew Carnegie, the 19th century industrialist and millionaire best known for his expansion of public library systems. Carnegie agreed to give $8,000 for building a free library in Lyndon provided the Valley Brook Township agreed to maintain the library at a cost of at least $750 per year.Five lots were purchased by the township from Mrs. Florence Richardson, and Hussey signed an ordinance stipulating the city of Lyndon would provide $50 per year for library maintenance. The library was opened in 1910. The first librarian was Gertrude Cummins. From 1919 to 1973, Miss Anna Hedges served as librarian. Miss Linda Jones served as librarian from 1974 to 1977. Miss Sarah Reece was librarian 1977-1980. Sarah Walker-Hitt has been library director since February 1980. Virgle Sims served as a library aide as a Green Thumb worker. Sharon Thurman Culley has been the library assistant since September 1989. The Valley Brook Township board appoints the library board, consisting of five members and the trustee of the township board, who live within the township limits. Current library board members are: Kim Sprecker, Martha Gregoire, Kay Jones, Kristen Kneisler and Erin Cole. Current Valley Brook Township members are: Kevin Payne, trustee; Don Garrett, clerk and Dan Dehn, treasurer. Today the library is full to the brim with books, computers, copiers, fax machines, printers, movies and patrons. Andrew Carnegie never would have dreamed how libraries have changed in 100 years. The Lyndon Carnegie Library is a member of the Northeast Kansas Library System, and is part of a large shared automation system. More than 30 member libraries, with more being added, share their online catalogs with each other. Patrons can use their cards at other libraries and place holds online from any computer. Items are delivered and returned by a statewide courier service. The library is open Monday 9 a.m.-12:30 p.m. and 2-7 p.m.; Tuesday to Thursday, 9 a.m.-12:30 p.m. and 2-6 p.m.; Friday 12:30-4:30 p.m.; Saturday 9 a.m.-12 p.m.; closed Sunday. For more information, call 785-828-4520, visit http://www.lyndonlibrary.org/, or stop by the library at 127 E. Sixth St., Lyndon. Information provided by Lyndon Carnegie Library and library director Sarah Walker-Hitt. 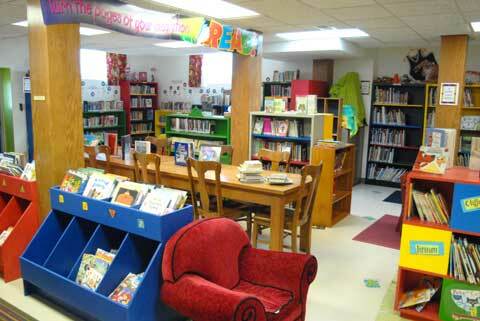 Children’s reading room at Lyndon Carnegie Library. 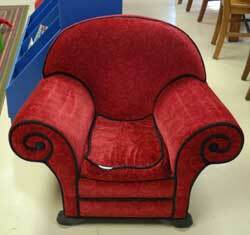 The Lyndon Carnegie Library has a special, comfortable reading chair reserved for young readers only.